This set of 2 paintings were done for Sara and Jason (New Brunswick) back in January 2011 (it’s taken me a while to update the site – apologies!). The Loon symbolizes Peace, Tranquility, Generosity, Communication and Serenity. It was about 10 months between the time I agreed to paint these and the time I actually got them done. It didn’t take too long to come up with Sara’s symbol. I narrowed it down to about 3 options, and the Loon was the one that Sara immediately connected with. Sara confirmed she always had an affinity to the Loon, so the fact that it was one of the options I gave her made it the perfect choice. There are 2 Loons in the painting for Sara, in a Yin and Yang motif. The colours I chose represent her electric personality, and the energy and mystery of the Loon. Vibrant red with a dark gun-metal / earthy toned grey for contrast, and a smidgen of grey/taupe to meet the opposing forces in the middle. The whale is the historical record keeper and the master of navigation. 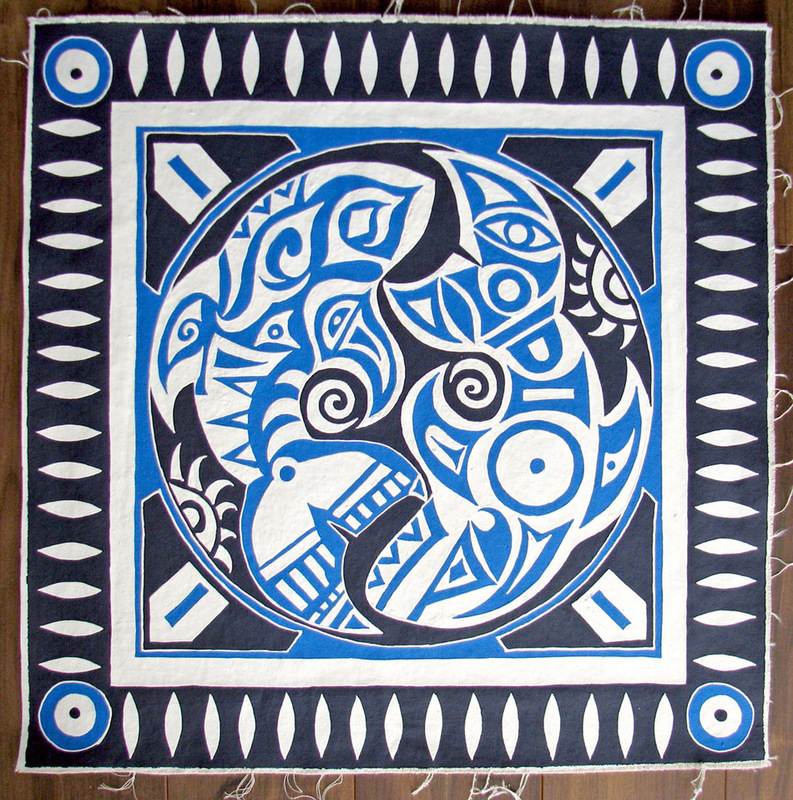 It symbolizes regeneration, death, rebirth, guardian, power of water, traveler,creativity and intuition. Is is thought of as being all knowledge associated with voice, psychic and telepathic abilities. It is attached to all aspects of the sea, connected to the emotional depths of the ocean, beauty of movement, creation, power of song, awakening inner depths. It symbolizes well-being, nurturing as well as emotional depth. It is said that people who have a strong affiliation with whale energy may also be very deep and sensitive souls. People with Whale Energy (or who carry the Whale Totem) are perceptive and nurturing and must be careful to not take on the pain of others. People who are attracted to the whale often feel devoted to a greater cause, and although they may struggle with their own personal emotions, they tend to naturally conjure healing powers towards others in emotional trauma. 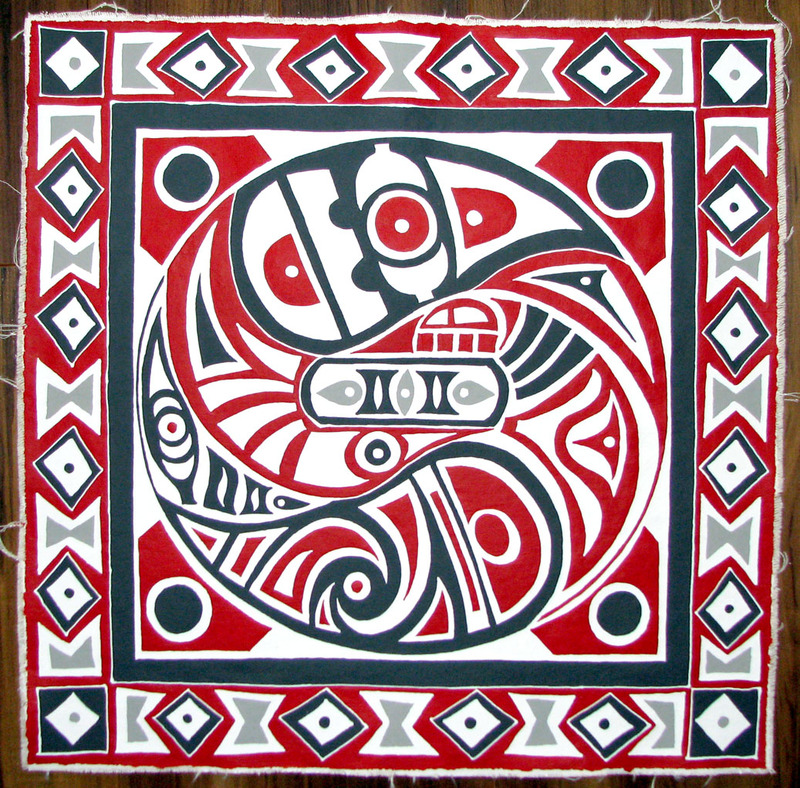 In the native culture, the whale symbolizes new beginnings and the creation of all life on earth as we know it. Tammy first expressed interest in one of my paintings way back in 2002, but wanted to wait until she had her own place and her own wall to hang it upon. Of course, you would think that after 4 years of knowing that eventually I would paint her something, I would have come up with a title, but they don’t always accompany a painting, or set of paintings. I guess I could technically call the set of paintings “Stupid Store” but that is a private joke between Tammy and I, and while we would think it funny, the rest of the planet would find it most odd. Then again, most of the planet finds me odd anyway, so no great loss there. Anyway, Tammy’s dream came true this pace summer when she moved into her brand new house with her partner Tyler and 5-year-old son Parker. We started to discuss her paintings more seriously back in June 2006. We agreed on the wall we’d be using and she loved the symbols I suggested, and I went to work on the designs. It didn’t take me long. In fact, I had all three ideas drawn out in a matter of hours. However, it took me over 3 months to get them to a place I was satisfied with colour wise (granted, this past summer I was working on 9 paintings at the same time – so my focus was more challenged than normal). In fact, I painted the Whale and the Loon paintings twice. I just wasn’t satisfied I’d captured what I’d wanted after the first attempt, so I trashed them and started over. I am much happier with my second attempt. You know… I had a really good reason for coming up with this name while I was painting this one. But, akin to the fellow who first discovered insulin… I forgot to write down why it is that name struck me. I can tell you, I’m sure it was something brilliant. This is in my living room. Although I find my “inner animal” is essentially an otter, I still use the bird and whale as my symbols. I use the bird as I was born in the year of the bird (Tibetan). Okay, and yes I admit, I’m a Richard Bach fan and there is probably something in there which is a throw back to paying homage to Jonathon Livingston Seagull . I also love the resiliance of the whale (I have a Maori tattoo of a whale tale on my ankle), symbolizing strength, bravery, cosmic truth, and unity. This design has been a bit of an evolving work in progress, but definitely one of my favourites which is why I have done so many of them. It has the sun and moon I use quite often, followed by a different take on the cycle of life (why I found it appropriate to give to the hospice). The bird (yin and yang) for flight, and the whale for perseverance. This is one of the pieces I donated to the Sarcee Hospice, where I work (when I have time… sorry Sandy, I’ve been really busy… honest!!!) as a Palliative Care Crisis Volunteer.